I am subject to enthusiasms, especially when it comes to making things. 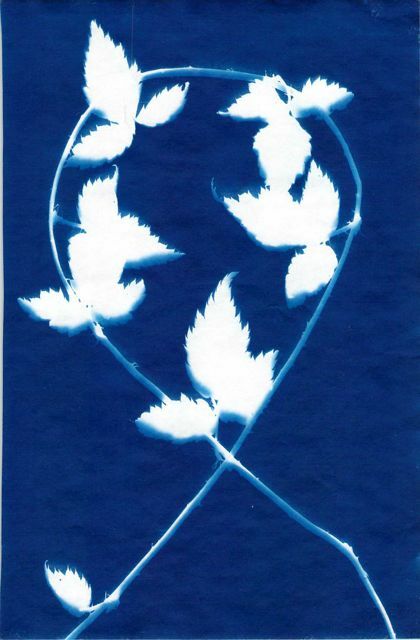 The most recent bee in my bonnet was making cyanotypes. Many people know them as sun prints: you get (or make) special paper, expose it to the sun masked with something interesting, and get a beautiful blue and white print. This enthusiasm started with wedding research. I’m getting married in September, and a recently married cousin gave me a ridiculous stack of Martha Stewart wedding magazines. Although very pretty, they yielded surprisingly few ideas. One idea that did appeal was cyanotype place cards, done up with ferns and whatnot. 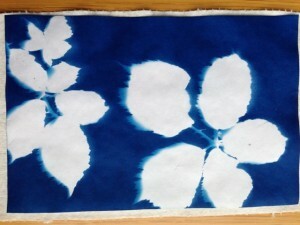 I did a bit of research, and established that although pre-treated cyanotype paper ran roughly a buck per sheet, there were lots of great how-tos on-line explaining how to do it yourself. I ordered the chemicals . . . and then we bought a house and moved and six months went by. That may not sound like the proper course of an enthusiasm, but I’m not quite that obsessive. Rob and I finally got around to mixing the chemicals up a couple weeks ago. There are two separate chemicals involved, green ferric ammonium citrate and potassium ferricyanide. Mixed separately with distilled water, they are fairly stable. 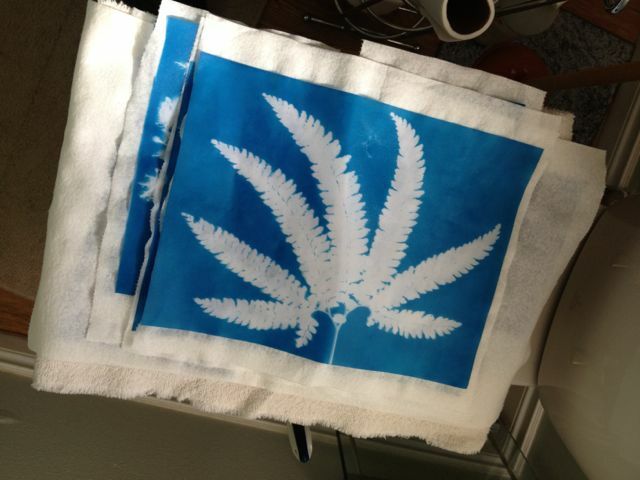 Once combined, they become UV sensitive, and should be used to treat your paper or fabric reasonably promptly. I’m not going to go into the details here – we followed the excellent how-to on instructables. There are a bunch of other how-tos on line. We used rice paper instead of watercolor paper. 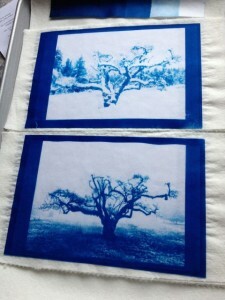 It took the solution beautifully, but was somewhat delicate when it came to rinsing the completed prints. 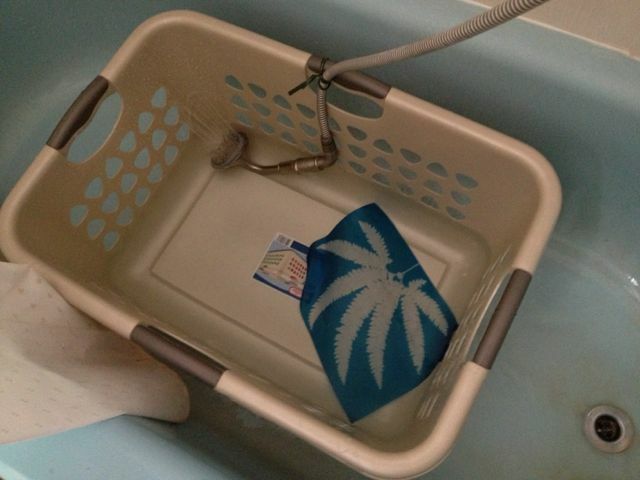 First we treated the paper, then dried it. Apparently you can do the prints on a wet medium, but that has complications. 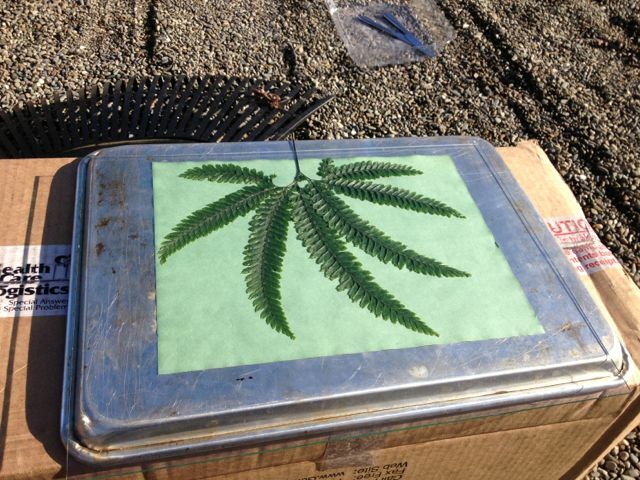 We then locked the paper away in a light-safe box (cardboard box wrapped in a trash bag, stored in the basement) and waited for a sunny day. That could have been a long wait in Washington in winter, but we got lucky. We got a sunny two-hour slice, and made the most of it. 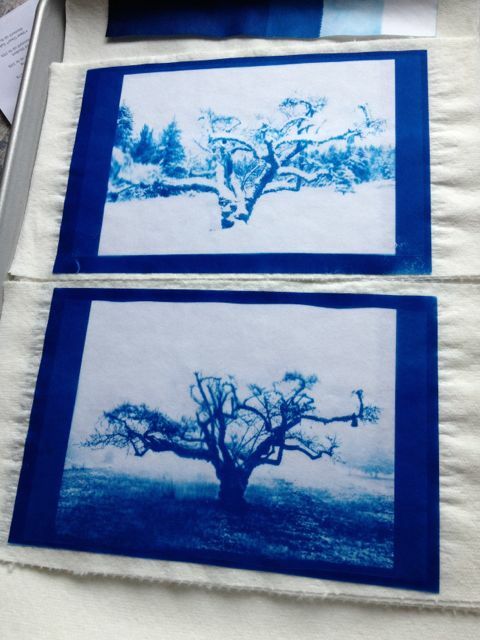 We started by printing a test strip that indicated that the best exposures would be between five and ten minutes, depending on the desired shade of blue. For the natural-object prints, it was important to pin the materials down with a piece of glass. Even so, you can clearly see where the leaves and stems were not pressed down firmly. That could either be a bug or a feature, depending on your outlook. We chose to consider it a feature! The hardest part was rinsing the prints. As mentioned above, we used rice paper, which has many advantages but is rather delicate when wet. I rigged a wash basin with a laundry basket and a hand-held shower nozzle. It worked pretty well, although if we left prints in too long they formed some signs of wear. The whole thing was a blast, and offers lots of options for further fun. You can print on fabric as well as paper, and it is color-fast (although you have to be careful about what detergent you use). My enthusiasm has temporarily run its course, although this summer I’ll probably do some fabric. 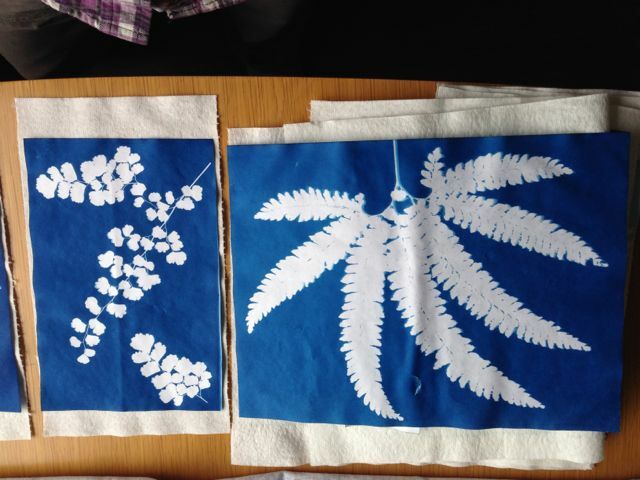 I would recommend cyanotypes to any craft-minded person. It would be great fun with kids, too! Terrible Things Happen – Should We Write Them? This week’s shooting of three young Muslims in Chapel Hill got me thinking about just how many terrible things happen in the world, and the degree to which that should – or should not – be included in a work of fiction. So far 2015 has seen mass killings; people killed or brutalized by police; people killed or brutalized by terrorists and extremists; and the standard run of murder and assault. And those are just the headline-worthy woes. If you get into the weeds of day-to-day prejudice and violence . . . well, why get out of bed in the morning? I don’t think I’m the only one who finds it soul-crushing. And yet it is happening, it is real, and ignoring it does not seem to be the answer. Should We Include Such Things in Fiction? Depicting hate-driven violence can help acknowledge that it is a real problem in our society. Such depictions can also be sickening and pointless. Of course, that is part of the point, but if I had run across the Chapel Hill shooting in a work of fiction – three nice young Muslims, two of them newly wed, gunned down by a hate-filled white atheist – I would have wondered why the author had chosen to include such a pointless horror. However, we live in a world where such things are, horribly, a reality, and completely ignoring them does not seem to be the answer. What to Include and in What Degree? In a way “should we include it” boils down to two separate questions. What should we include, and how much of it should we include? For example, if a work depicts prejudice, is it going to focus on the subtle day-to-day prejudice that is so insidious, or is it going to depict an all-out hate attack? I think the “what” depends somewhat on the type of story, but humans being humans there is almost always some sort of prejudice available for consideration. I think it is a valuable thing to address in some form, whether it is class-based, age-based, race-based, gender-based, or something else. Really, “what” to include comes down to thinking through the dominant groups in a work, and how they would rub along together. The “how much” can be a little trickier, and is likely to be more dependent on the type of story. If a religious war is central to the plot, then terrorist attacks are perfectly appropriate. In a character-driven story where prejudice is a background element, rather than a major part of the plot, I think that keeping it to a background noise level is appropriate. It still acknowledges the problem. And really, that is the degree of problem that can realistically be addressed. I think the truly horrific attacks grow out of the fertile soil provided by general prejudice. If the general prejudice were not there, these attacks might not occur, or might manifest in a different way. I think it is very important to acknowledge the existence of prejudice, and to consider the impact it has on various members of a story. I don’t think that the prejudice ever needs to escalate for its inclusion to be valuable. Many of us are uncomfortable with discussions of prejudice. Racism, religious prejudice, sexism – they are all loaded. One thing that science fiction and fantasy bring to the table is the ability to mirror our world at safe remove. For example, I’ve always found it interesting when a work of sci fi replaced inter-human racism with xenophobia against aliens. It is sad that we have to go to an alternate reality to have a proper discussion about our irrational fears and biases, but at least we can take advantage of that safe space! Thoughts on the subject? Please comment!